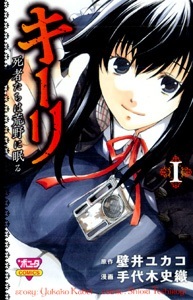 Kieli: Shisha-tachi wa Kouya ni Nemuru was published in English by Yen Press on April 22 and October 28, 2008, respectively. The reason I picked up this manga in the story and bought it was because of the art style. I thought it looked so pretty, it stood out to me. Little did I know that the manga itself in every aspect was also very awesome. I don't have much more to say about the art style, I just loved it and I think anyone that likes the modern style of manga will too. The story itself, or the main theme I should say, isn't too original unfortunately. It's another 'they can see ghosts since they were little and no one else can' sort of thing. But there's enough plot twists and orginality in it here and there that I still found it quite nice. Another part, besides the art, that I really enjoyed, were the characters. The main character, Kieli, isn't just another annoying school girl, she's actually got some real emotion and personally, I think it's cool that she only makes friends with ghosts. Of course, I really love Harvey too, I've got a soft spot for the cool guys. Not much else to say here, but I think most people can appreciate one or the other, or in my case, both. The story starts out 15 years after a war that depleted the planets resources and a war that created a creature called the Undying. After the war though, the church went on a mass scale killing spree of the undying, much in the same way the Vatican got read of the Knights Templar if you want to link it to our history. In that sense, it makes the manga a bit more believable even if it is talking about the supernatural. It’s interested that before we are even introduced to Kieli, we are given a back story on this world they live on which isn’t earth, it’s a different planet they live on that the church founded itself on. Then it jumps to 80 years, and then another 7 to the time in which the story really does start. I can see somewhat why Kieli is pretty much a outcast and I don’t think its just because she can see ghosts. She seems to also have a belief that is not the same as the teaching of the church that runs her home. A church with soldiers that will kill someone right in front of a mass amount of people, calling it a justified killing. Her grandmother seemed to try and protect her from them by telling her not to speak of seeing spirits and her beliefs but when her grandmother died, she was left in a care of a church boarding school. Becca, her ‘roommate,’ sadly doesn’t stay throughout the manga. She is only there during the first chapter and it’s a very heartwarming story with her when she leaves us. A young girl who died from a train accident and then became best friends with a girl who never had any other friends. I could really feel for her and for Kieli when she is leaves. Harvey on the other hand is a reanimated corpse, the Undying as they are fully called. He has to be very careful because of the church wanting to kill his kind so he seems a bit cold sometimes. Sometimes even, his hunted radio seems to have more tact then he does in the ways of people’s emotions. Even though, Harvey has a bit of a heart and does show some times where he is gentle to Kieli. Another surprising trait is that he is actually warm to the touch. Kieli actually talks about this at one point in the first book and yet, he is supposed to be pretty much a zombie. The last person I have to talk about is Corporal. Corporal has no other name then his rank but he knows so much from the time before the church had so much power including different types of music and how to understand a persons feelings. I consider him somewhat a big brother or adult to Harvey and Kieli because he does seem to take interest in the two and care for them slightly. Becca called him an evil spirit when she first met him but I only see him as a spirit just trying to find a place to go. He does have a wicked temper at times that he shows in the first chapter but I have my suspicions that it was more on the line of trying to protect Harvey, even if in the flight of rage, he ended up hurting him. The artwork is actually rather beautiful with large blotches of ink to show blood. The characters are rather detailed but don’t feel as though they stand out of their world. Even the ghosts look as though they are still alive most of the time except for Corporal when he is in his static form. In the end, this is a very heartwarming manga that will probably make you cry. Kieli is a sci fi sort manga based on a book series. Basically, the story is about a girl who sees ghosts, that meets a boy that is not actually alive. The whole Kieli world is interesting, as it is kind of distopian and full of action. I liked how the story just had a smooth flow, and, even though the events were kind of easy to predict, the story was entertaining and full of action. The manga itself felt like those old school ones, especially the drawings. Finally, the one thing that just didn't work for me was the fact that the story was repeated at the begining of each chapter, which is just something that bothers me in every manga, but still I had to point that out. The first time i saw this book was in Waterstones and just by the the beautiful coverart (by Shiori Teshirogi) i decided to buy it ... and hour later and i was thirsting for more!! The star of this story is a 14 year old school student, Kieli, who has the ability to see ghosts. She has always felt alone due to her abilities and so therefore finds the company of ghosts more comforting than normal humans. However one day she meets Harvey, an Undying (pretty good looking ....BONUS!!! XD )and Kieli finally finds someone who she is able to be herself with. .